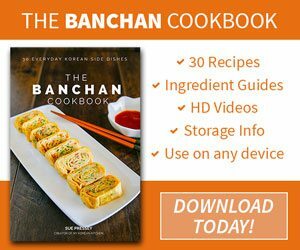 Delicious Korean chicken skewers – Dakkochi recipe! Dakkochi (닭꼬치) is a popular grilled chicken on a stick. It’s often coated with thick, sticky, and addictive sauce. Some sauces are sweet and salty and some are sweet and spicy. But below you will find both options, so you get to choose! You can easily spot a food stall selling chicken skewers / chicken kebab on a street in Korea as it’s one of the most popular Korean street foods. Are you ready to give it a go? Enjoy! 1. Combine all ingredients in a medium bowl. Mix them well. Set it aside until needed. 1. Combine the soy sauce, honey, ginger and garlic in a sauce pan and boil it over medium low heat until it starts lightly bubbling. In the mean time, combine the water and cornstarch in a small bowl and whisk it well. Remove from the heat and set it aside until needed. 1. Immerse the skewers in some water (if using wooden skewers) for about 30 mins. 2. 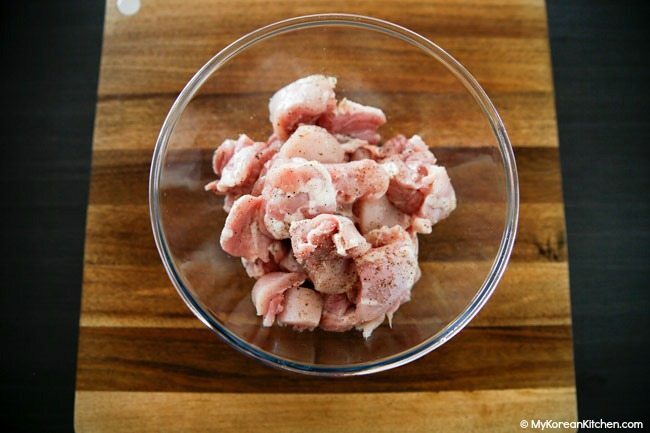 Place the chopped chicken pieces into a mixing bowl. Add the rice wine, some salt and pepper. Mix them well. Set it aside while other ingredients are being prepared (about 5 mins). 3. Remove your bamboo skewers from the water (from step 1) and gently wipe them with kitchen paper. 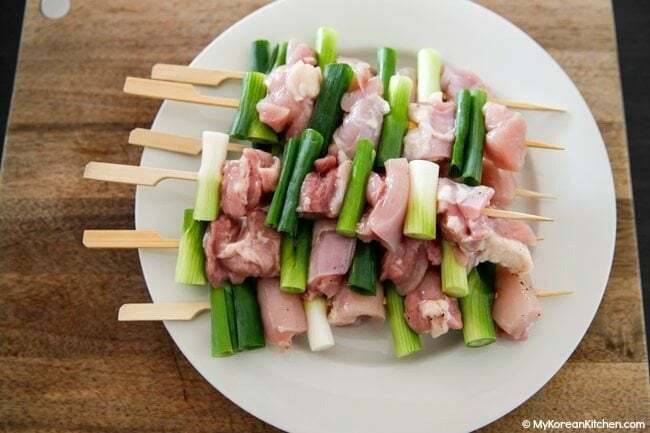 Put through chicken and green onion pieces onto a skewer in alternating order. Make sure all the meat and green onions are tightly packed. It should give you 12 skewers based on mid length skewers (25cm / 9.8 inch). 4. Spray some cooking oil over your choice of cooking element (e.g. grill / skillet / sheet pan). Place the chicken skewers on a grill / skillet or under broiler and cook them over medium high heat. 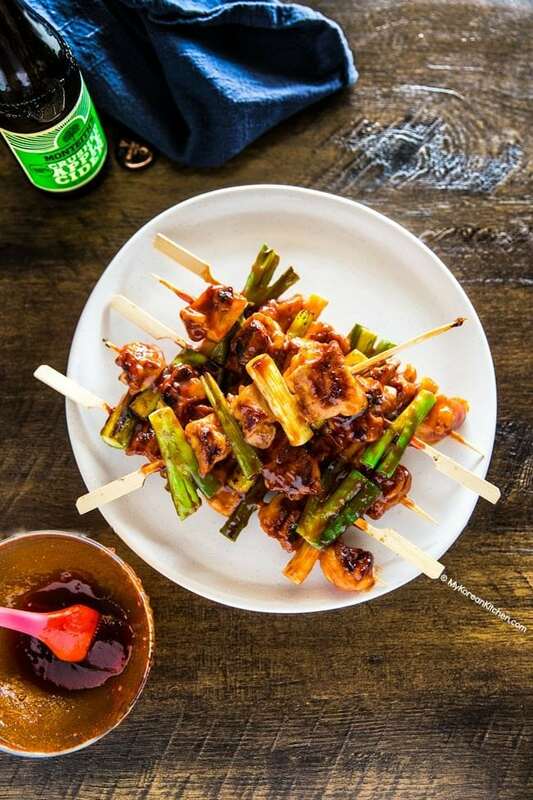 About 3 mins later turn the skewers around and start brushing your choice of sauce onto the chicken and green onions. In about 2 mins, reduce the heat to medium and turn the skewer over again and brush the sauce. Reduce the heat to low. Chicken will cook faster when covered with a lid. If you’re using a 30cm / 12 inch skillet, you can fit three – 25cm / 9.8 inch skewers at a time. 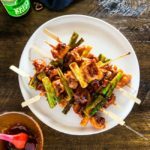 Is soaking wooden skewers in water necessary? If you google the above question, you will get heaps of contradicting answers. Some says ‘yes, it’s a must because it minimises the chances of sticks being caught on fire’. While other’s say ‘it doesn’t make any difference’. Based on my experience with my electric grill, skillet and broiler, I didn’t notice any difference, but I’m just covering my bases in case it causes a problem for you. Obviously, if you’re using metal skewers, there’s no need to soak. However, my husband finds that when using a BBQ with flame, that the sticks will char less if they have been soaked. 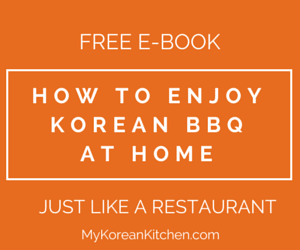 Learn how to make Korean chicken skewers. This recipe comes with two flavoring option! -Combine the soy sauce, honey, ginger and garlic in a sauce pan and boil it over medium low heat until it starts lightly bubbling. In the mean time, combine the water and cornstarch in a small bowl and whisk it well. -Remove from the heat and set it aside until needed. Place the chopped chicken pieces into a mixing bowl. Add the rice wine, some salt and pepper. Mix them well. 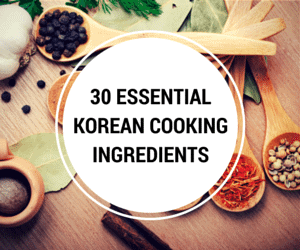 Set it aside while other ingredients are being prepared (about 5 mins). Remove your bamboo skewers from the water (from step 1) and gently wipe them with kitchen paper. Put through chicken and green onion pieces onto a skewer in alternating order. Make sure all the meat and green onions are tightly packed. It should give you 12 skewers based on mid length skewers (25cm / 9.8 inch). 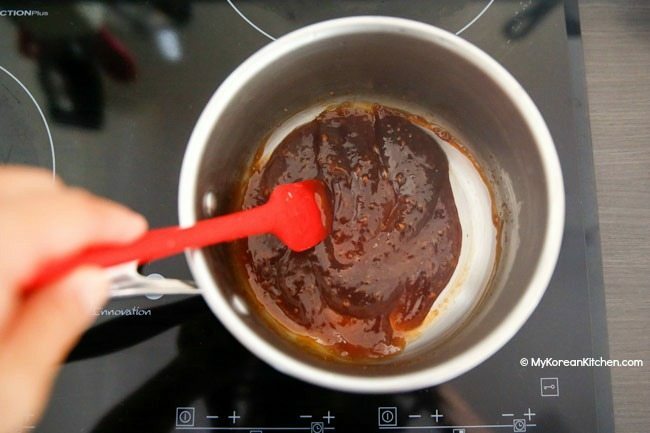 -Spray some cooking oil over your choice of cooking element (e.g. grill / skillet / sheet pan). Place the chicken skewers on a grill / skillet or under broiler and cook them over medium high heat. 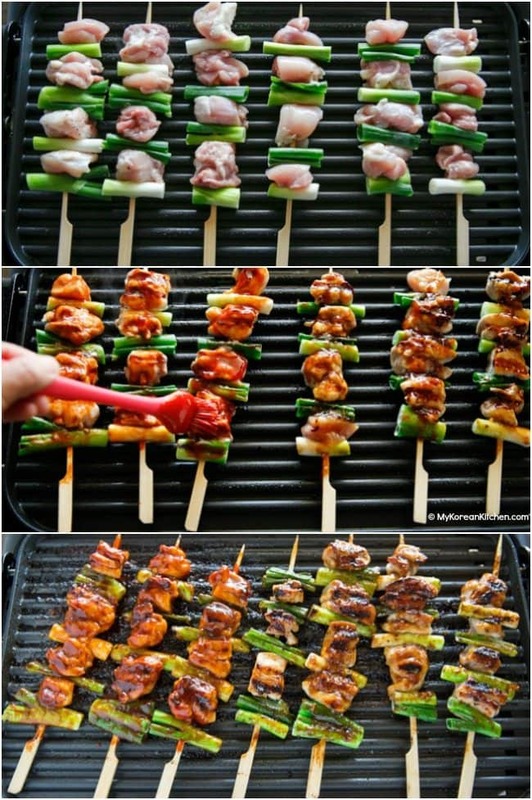 About 3 mins later turn the skewers around and start brushing your choice of sauce onto the chicken and green onions. -In about 2 mins, reduce the heat to medium and turn the skewer over again and brush the sauce. Reduce the heat to low. 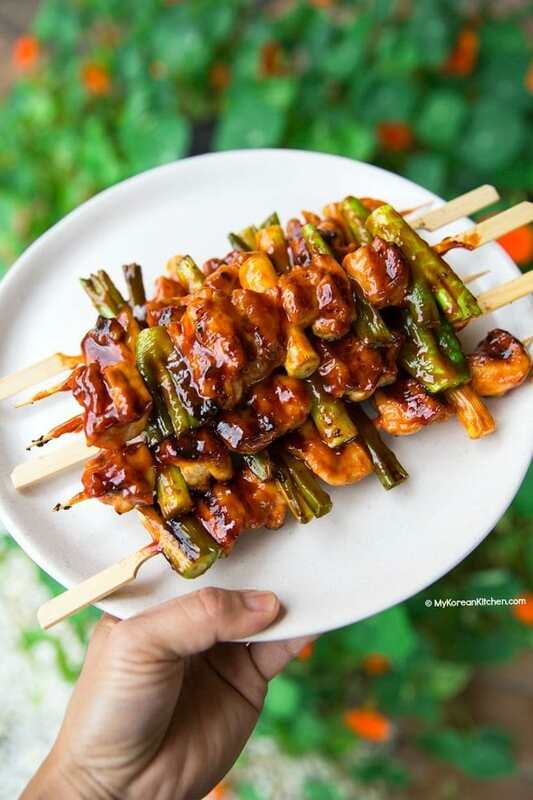 -From here onward, continue to turn the skewers and brush the sauce on the skewers until the chicken is fully cooked and charred to your taste. Serve immediately. I’m so happy to hear that! Thanks for your photo and feedback! It looks delicious and so attractive. sure am gonna try this. Thanks for sharing the recipe. Delicious recipes, going to try it on the coming weekend. Made them yesterday for dinner on the BBQ, they were a hit. Tried both basting sauces, both excellent. My 6 year old loved the dakkochi! Sue, these were fabulous! Used only the gojuchang sauce (doubled) with extra garlic and had a cook out!!! Easy, tasty and spot on! Thank you! Keep it coming! Carolyn, why not substitute tofu?